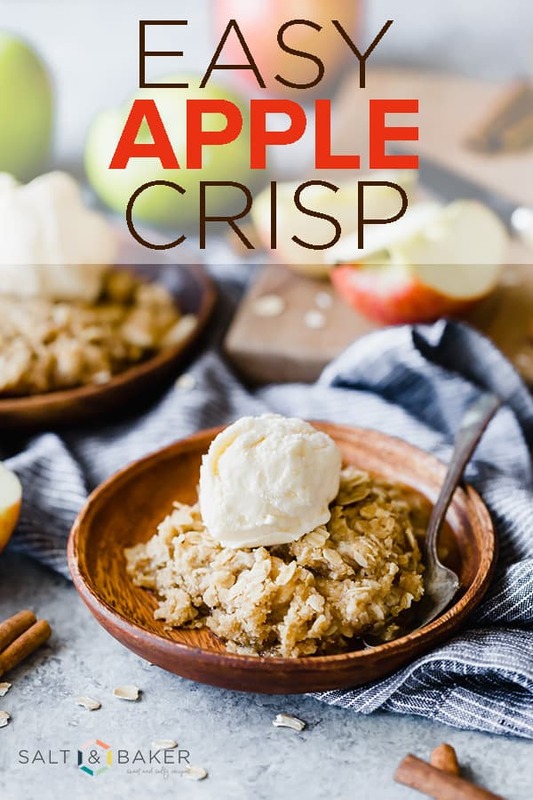 This is an Easy Apple Crisp Recipe that you’re bound to love! 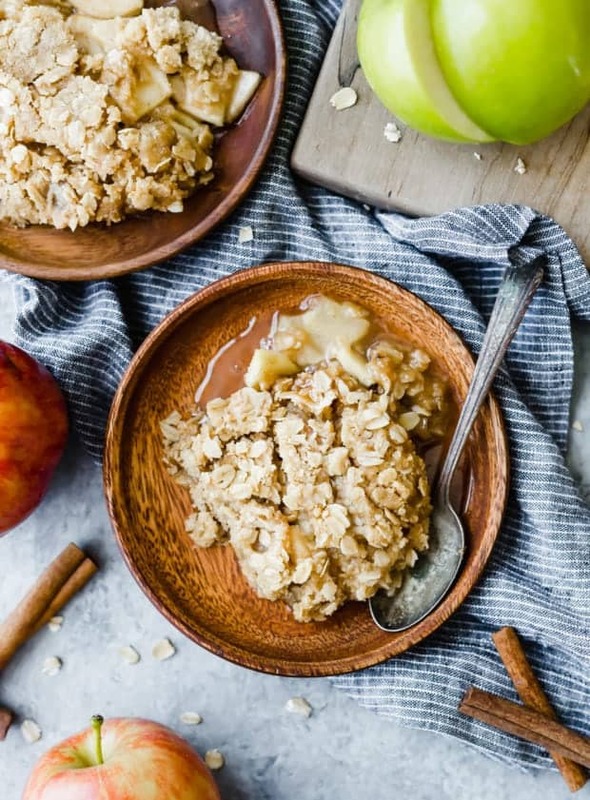 It uses freshly chopped apples and is topped with an irresistible buttery oatmeal crumble. Serve it cold or serve it warm! 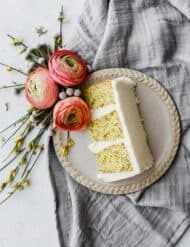 I recommend you serve it warm with a big scoop of homemade creamy vanilla ice cream! I know what you’re thinking, “Does it taste as good as it looks?” YES! Yes, it does! 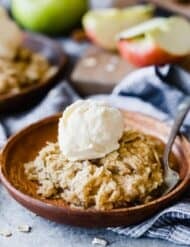 This EASY apple crisp recipe has been in my family for years. When September and October come rolling around, we have oodles of apples at our disposal. Buckets and buckets full of apples. (My dad has at least 5 apple trees in his backyard). What to do with all of those apples? We would make caramel apple dip, apple pie caramel apples, fresh apple juice, apple pie, and my favorite… apple crisp! 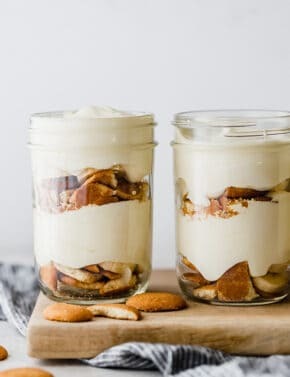 Apple crisp is also known as apple crumble. 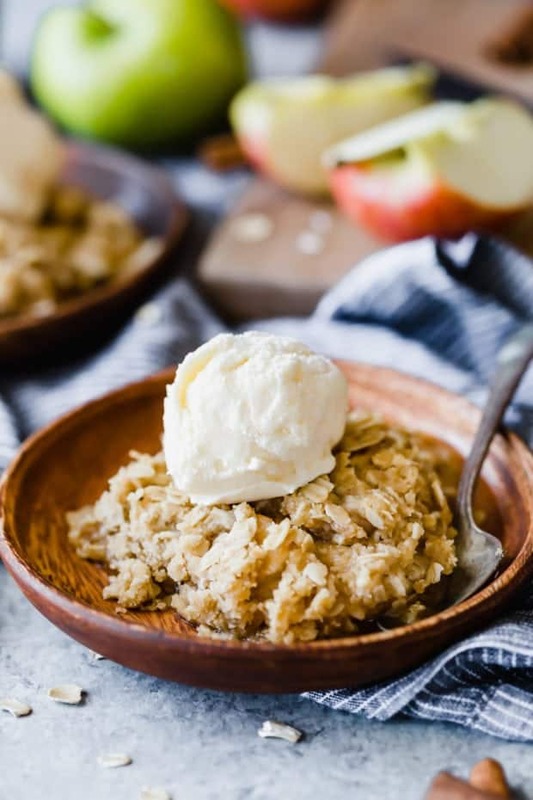 Apple crumble is the preferred name for those living in the United Kingdom, Canada, and Australia. Whatever you choose to call it, they’re the exact same thing. ? Apple crisp contains fresh apples topped with a streusel topping that gets baked until the apples are soft and cooked. Any kind of apples will do. 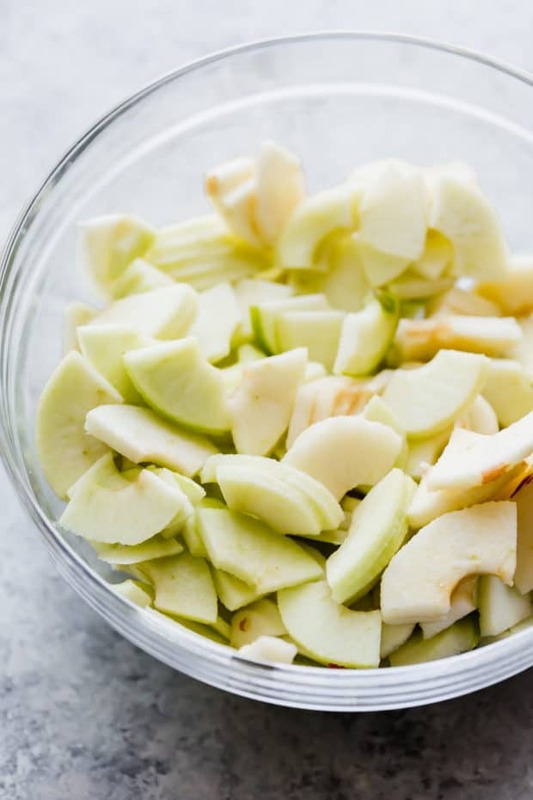 Granny Smith apples are very tart so they pair well with the sweetness of the added sugar. I like to use a blend of Granny Smith and Gala apples or even Honeycrisp apples. The beauty of it is that you can use whichever apples you have on hand! Do you have to peel apples for easy apple crisp? Technically, no you don’t have to peel the apples before making apple crisp. However, I recommend you do. I’ve made apple crisp with the skin on and I don’t enjoy it. Despite the apples cooking in the oven long enough to soften the flesh and the skin, I found the skin to be chewy and catch in my throat easily. Do as you wish. If you keep the skins on, PLEASE leave a comment at the bottom of this post and let me know what you think! Peel, core, and slice apples. This doesn’t need to be a time consuming process. I use this gadget to speed it up! Works wonders! 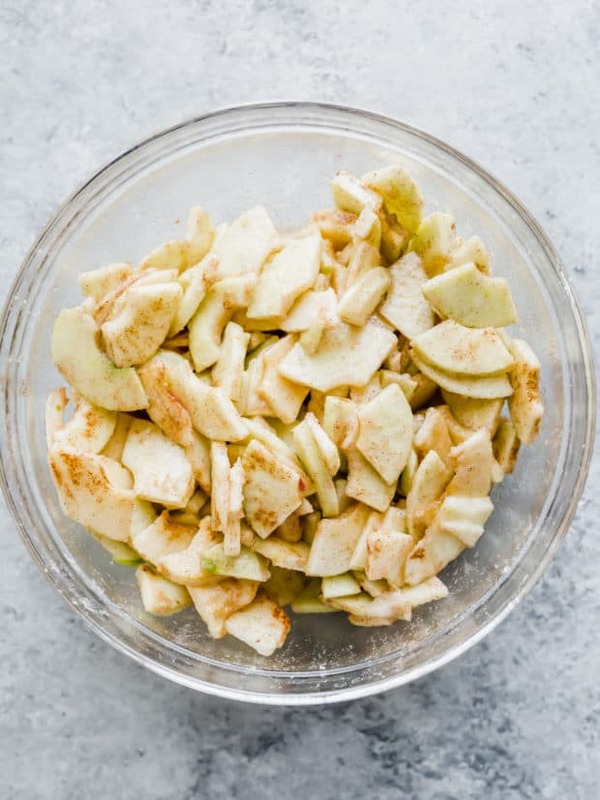 Toss the cut apples with the sugar, flour, salt, and cinnamon. Place the sugar coated apples in a baking dish. I use a 9 inch square baking dish. Make the streusel topping by combining the ingredients together. Cut the butter into the dry ingredients by using a pastry cutter, a fork, or your hands. Sprinkle the streusel topping over the apples. Bake until golden brown and the juices are bubbling. Now that we’ve covered a few common questions regarding a basic apple crisp recipe, I wanted to remind you that THIS apple crisp trumps all. Well, an important part to any apple crisp is the streusel crumble on top. It can’t be a thin layer. No. That doesn’t work. 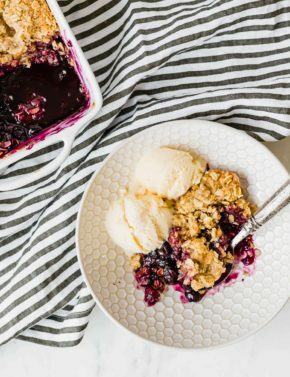 There needs to be enough crumble to accompany every single bite of apple. 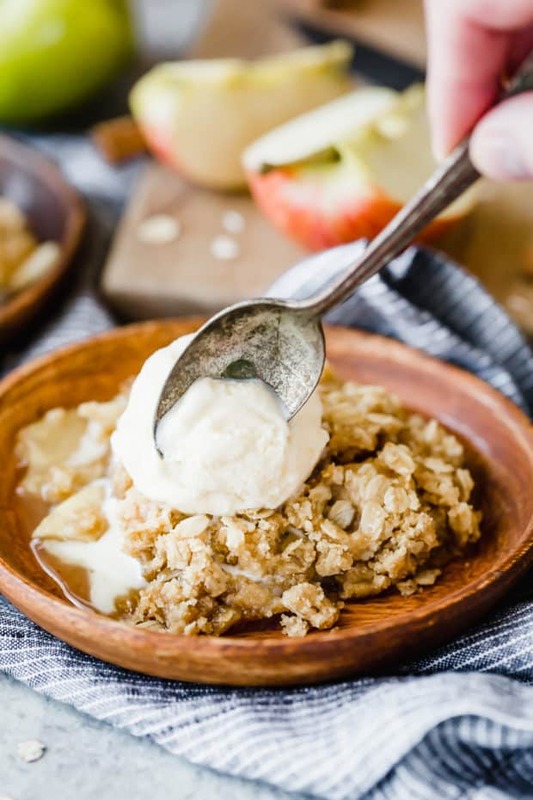 And this easy apple crisp recipe does just that! Don’t feel pressured to eat this all in one sitting, although, I’m sure it can be done (don’t ask me how I know)! Apple crisp will last for about 3 days. I recommend you cover it with plastic wrap and place it in the refrigerator. 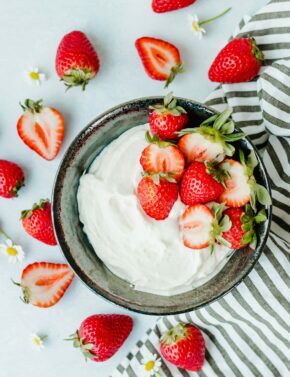 When ready to eat it again, pull it out and eat it cold, or better yet, heat in in the microwave for 15-20 seconds, top it with vanilla ice cream and dig in! The BEST apple crisp! 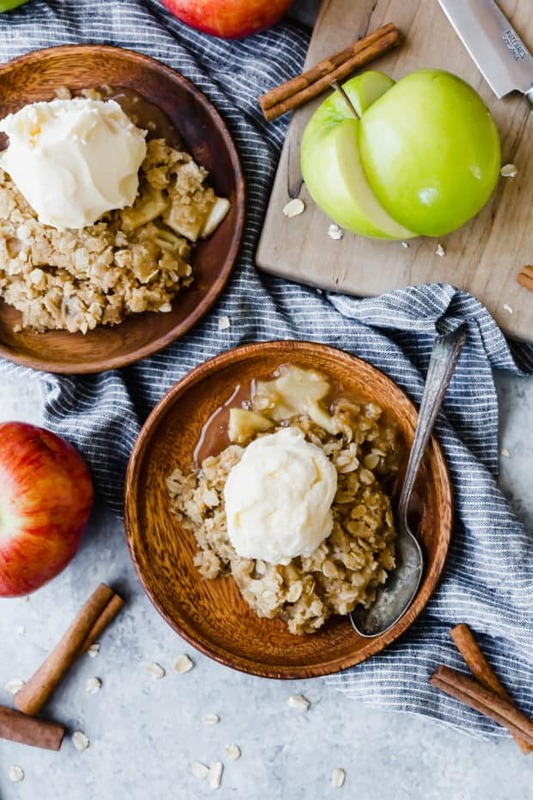 Freshly chopped apples topped with a buttery oatmeal crumble. Serve it warm with vanilla ice cream. 1/3 cup butter cold. Cut into 1/4 inch cubes. In a medium size bowl add the sugar, flour, salt, and cinnamon. Mix to combine. Add the sliced apples and toss to coat. Transfer the sugar coated apples to a greased* 9 inch square pan. In a medium size bowl combine the oats, flour, baking powder, and brown sugar. Mix to combine (I just use a fork). Add the cubed butter to the mixture. Using a pastry blender, cut in the butter, until the mixture resembles coarse crumbs. Spread the crumble mixture evenly overtop the sliced apples. Bake for 35-45 minutes or until bubbly and the top is golden brown. Remove from oven. Serve warm with a scoop of vanilla ice cream, yum! *To grease the pan, I used butter. However, you can use cooking spray. I love apple crisp! Looks so delicious and comforting!